This article is about the family of percussion instruments. For other uses of the term, see Shaker (disambiguation). They are called shakers because the method of creating the sound involves shaking them – moving them back and forth in the air rather than striking them. Most may also be struck for a greater accent on certain beats. Shakers are often used in rock and other popular styles to provide the ride pattern along with or substituting for the ride cymbal. 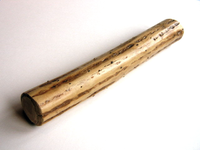 A shaker may comprise a container, partially full of small loose objects such as beans, which create the percussive sounds as they collide with each other, the inside surface, or other fixed objects inside the container – as in a rainstick, caxixi or egg shaker.